Palm Beach County's Jewish population, one of the most heavily-concentrated in the country, was split earlier this summer when Democratic Sen. Hillary Clinton stepped aside as presidential nominee. But the community seems to be coming together for Barack Obama. More than 100 people stood in line by 7 a.m. Tuesday outside Temple Shaarei Shalom in Boynton Beach. Michelle Sachnin, 41, a Jewish voter from Boynton Beach, admitted she was a Hillary supporter, but had no doubts where she would place her support come today. "Obama. I've always been a Democrat. And I believe in everything he stands for," Sachnin said. "I thought that the country would be better off with either of them," meaning Obama or Clinton. She said she didn't have many concerns on Obama's real or perceived stance on Israel. 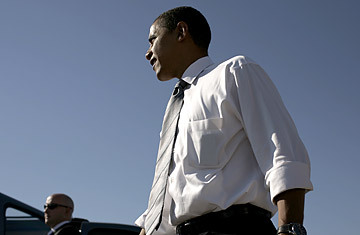 See pictures of the campaign from Barack Obama's point of view. A few minutes before polls opened at 6:30 a.m., it was still pitch dark along Cleveland's streets and difficult to see the campaign signs or even the "Vote Here" ones. But those who always vote at St. Mary's Romanian Orthodox Church on Cleveland's far west side knew exactly where to go. By 6:20 a.m. the parking lot was filling up quickly and an almost all-white crowd of 30-some voters had formed. All across Cleveland, polls opened on time and short lines formed immediately. See pictures of tough times in Cleveland. Ben Golnik, the McCain campaign's regional manager, asserts McCain is viable here, despite polls that have showed Obama in double digit leads and that the state hasn't voted for a Republican president since Richard Nixon in 1972. Golnik argued that a Hillary Clinton rally indicated Democrats were worried about their chances of taking the state. Clinton made two stops in Duluth, a northern city near the Iron Range where Republicans hope McCain can steal union votes from Democrats. Here in Michigan, medical marijuana is on the ballot. So is stem cell research. Election Day weather forecasts call for 72 degrees and lots of sun. Huh? Apparently, Michigan is masquerading as California. But in a year featuring record housing foreclosures, massive job losses and the prospect of the Big Three Automakers downsizing to the Nearly Bankrupt Two, maybe it shouldn't be a surprise that Michigan residents want to try something different. Some cities are predicting as many as 80 percent to 90 percent of those registered will vote. Election officials have added booths and volunteers, but are cautioning voters to be patient, and plan to wait in line.